Special guests Jennifer Grey and choreographer Kenny Ortega. 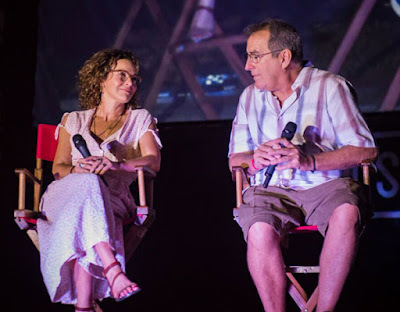 Before the "Dirty Dancing" screening, Street Food Cinema, in their season 6, welcomed special guests Jennifer Grey, the films star, and choreographer Kenny Ortega at their special screening of "Dirty Dancing," celebrating the films 30th anniversary, for an incredible Q&A at Will Rogers State Historic Park in Los Angeles. Henry Thomas ("E.T.") led band Farspeaker performing for the crowd before the special guest Q&A and screening. Street Food Cinema is also donating a portion of the profits to the Red Cross, in honor of Houston native and the the films male lead Patrick Swayze. The Street Food Cinema founders have strong family ties to the Red Cross and Houston. Steve Allison was raised in Houston and he still has family in the community and Heather Hope-Allison has had a strong family bond with the Red Cross since 1993. The local Red Cross assisted her family after their house fire in Ohio, her mother Lorna, a well-known local artist created a painting for them which was turned into a puzzle. In fact one of Hope-Allison’s first events was a Red Cross fundraiser. Street Food Cinema is going all night again on Sept. 30 at the incredible King Gillette Ranch in Malibu. Come celebrate the 30th Anniversary of “Lost Boys" at King Gillette Ranch in Malibu on Sept. 30. Street Food Cinema, the ultimate movie experience, evolves into an unforgettable camping experience right in the middle of the Santa Monica Mountains, just above Malibu. This summer night retreat brings to life the classic elements of everyone’s beloved favorite including Santa Carla Carnival games, vampire training, karaoke and 80's music videos celebration. Get ready to join “Lost Boys” on Sept. 30. 3:30 pm – Check-in opens. 6:30 pm – Band performs. 8:30 pm – Movie starts. 8:00 am – Catered breakfast opens.